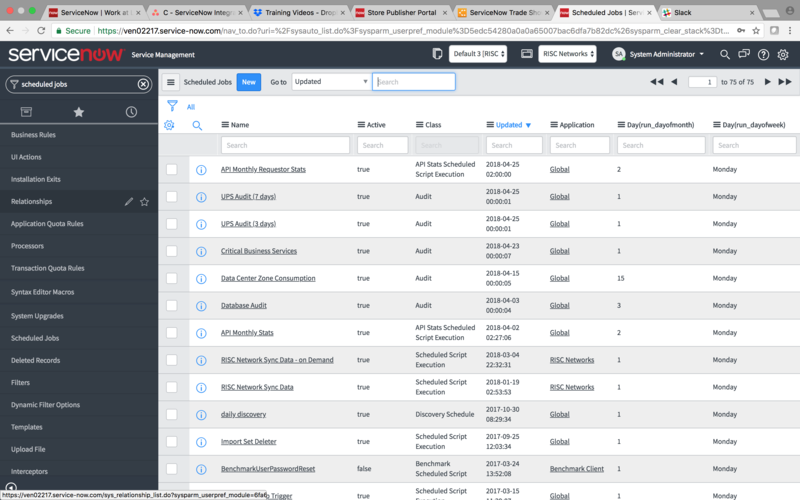 The integration with ServiceNow will allow users to very quickly perform complete asset and application discovery while getting their CMDB up to date. Time savings of more than 80% are possible with discovery and application rationalization finished in a few months compared to a year plus. RISC Networks is 100% independent, platform agnostic and self-funded since 2007. The RISC Networks vision is to unlock business potential by delivering more meaningful data analysis and providing information that helps IT leaders take immediate action. RISC Networks is the industry's leader in cloud, data center and network operations analytics with more than 12,000 analytics engagements and hundreds of industry leading solution partners. The company is headquartered in Asheville, NC. Create scheduled jobs with RISC Networks' application in ServiceNowScreenshot of scheduled jobs in the ServiceNow store.